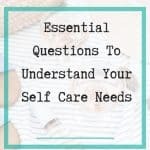 Trying to squeeze in a daily self care checklist can be a challenge, but can sometimes be the difference between balance and burnout, especially if you’re an overachiever, have too much on your plate or just generally love burning the candle at both ends. Me? I’m an overachiever. So practicing daily self care is something I’ve had to really work hard on to maintain my sanity. The problem is we are just so darn busy all the time. 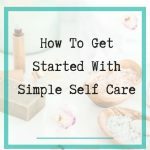 We’re overcomitted, overworked and overwhelmed yet having a daily self care checklist that becomes part of our everyday is exactly what we need to restoring some calm in amongst the chaos..
A totally doable daily self care daily checklist is the antidote to the constant busyness that drains your tank. Let me show you how to create space in your day to focus on your wellbeing, even if you think you don’t have any time available. I’ll show you how small gaps of opportunity in your day can be your biggest allay and how to use them to your advantage, instead of them being wasted time, down time or distraction time spent on social media. Its’s about finding these gaps of opportunity in your day and intentionally slowing down for a moment, detaching and focusing entirely on yourself before coming back to the task at hand. Here’s how to do it… Break it down into manageable chunks and do a bit at a time, as you have time. Select one item each for mind, body and soul to get started. Check your water intake. Are you on track to drink at least 8 glasses? 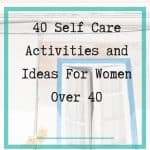 The time of day I practice self care for each of these areas might adjust with my schedule from time to time, but it makes it so much easier to fit it in when it’s in blocks I can slot in whenever I have a gap of opportunity in my day. 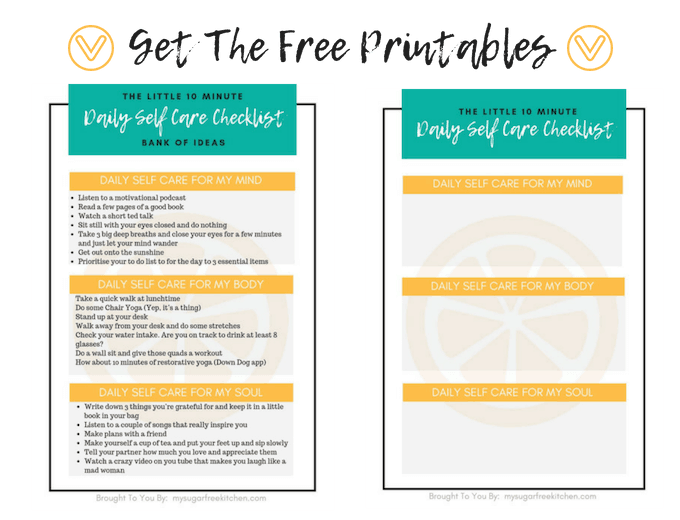 Grab the Daily Self Care Checklist PDF Printable and get started. Almost Done! 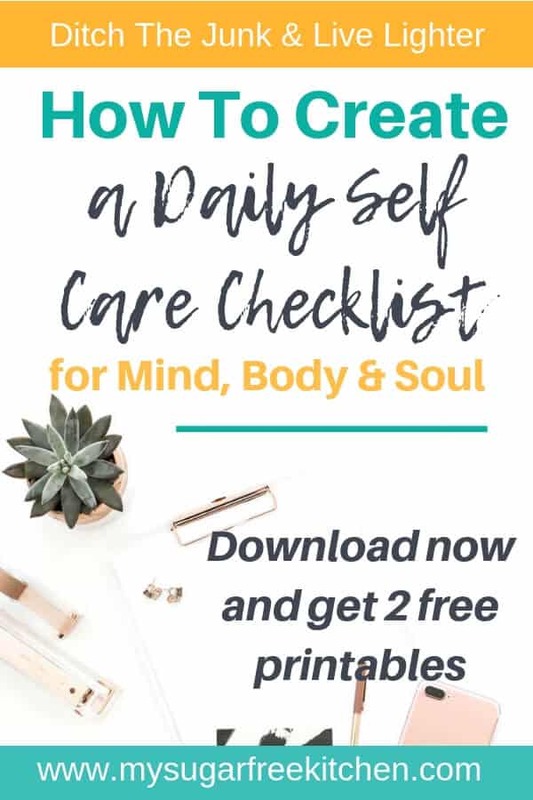 Check your email and download the Daily Self Care Checklist PDF's and get started on your self care today. Mind: Most mornings I do a quick seated meditation in the morning, usually with my dog beside me. I close my eyes and just focus on my breathing. Sometimes it can be harder than others to quiet the mental chatter, but I know I definitely feel better when I’ve had time in the morning to sit still and quietly before the busyness of the day sets in. I’m also a mad podcast junkie. I listen to at least 2 hours of podcasts everyday, from educational, and motivational to personal development. This is mostly on my commute to and from work, and at lunchtime. Body: In my 20’s and 30’s exercise was my thing, so much so that I had a career in it and even a business, but in my 40’s it’s a little more of a challenge. But I still make sure I find time to move my body every day. If it’s not a gym session, or a yoga class, I’ll be walking my dog. Soul: Whilst I love my coffee, I’m also a big tea drinker, so putting up my feet with a cuppa after dinner and thinking about the things I’m grateful for is something I do almost every day. ++++ I am obsessed with drinking water, so that is a given thing that goes on my daily self care checklist. How do you take care of your mind, body and soul? Do you have a set of things you do on a regular basis or are you a bit hit and miss? 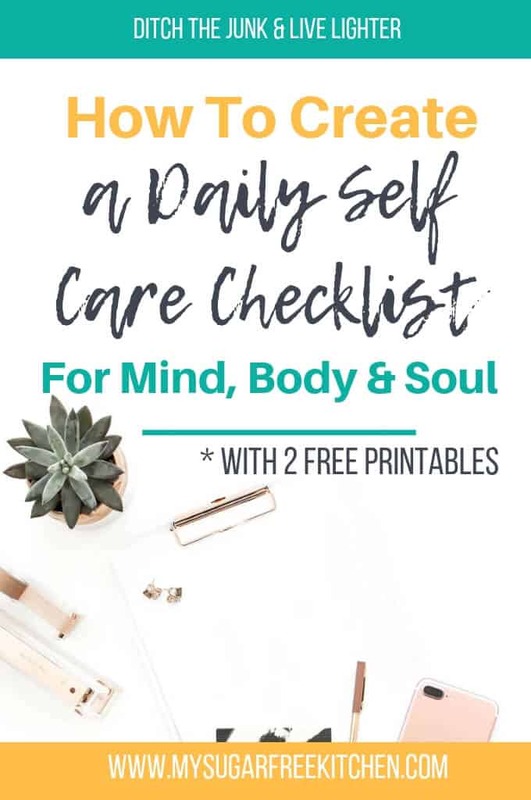 Is there one or two things that you can squeeze into your day to get started with your daily self care checklist? All you need is 10 minutes to begin to feel the benefits of self care. I’d love to know what you do for your self care. Leave me a comment below. Did you like this post? Pin It to Pinterest , and leave me a comment below.